To enable us to process your application please following the instructions below. This form should take about 5 minutes to complete. 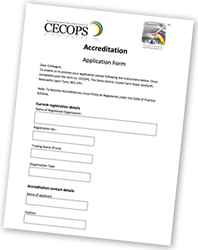 Completing this form is the first step in the process for becoming accredited under the Scheme, but does not at this stage commit you to proceeding. We may contact you for clarification if the information provided is incomplete. Note. To become Accredited you must firstly be Registered under the Code of Practice Scheme. You may choose to download a PDF version of the application form and post it to: CECOPS, The Dene Centre, Castle Farm Road, Gosforth, Newcastle Upon Tyne, NE3 1PH. (As you will be aware, this section automatically applies with both registration options i.e. entry and enhanced. You are therefore required to inform us which of the Code Standards within this section you would like us to specifically look at. Please indicate these in the box below. You must select a minimum of 4 Code Standards). If you are applying to have multiple sites Accredited please list these below. This form will be forwarded to the external inspection body. The inspection body will then contact you directly to explain auditing arrangements. Following the audit the auditing body will inform us of the outcome. If you have satisfactorily met the assessment criteria, you will be awarded a signed certificate and you will have the right to display the Accredited User logo. You Profile Page will be automatically updated to reflect your Accredited status. Please note, to retain Accredited User status you will be required to have an annual health check, with a full audit every 3 years. You will be contacted to remind you of this, 3 months prior to the renewal date. If you are not registered or do not wish to be accredited but would like to have an independent one-off health check, please contact us to discuss your requirements.